No bulbs. No heat. Instant start-up. Bright light everywhere, every time. Massive area lighting. 6000 Lumens. Illuminates up to 25 feet in all directions. 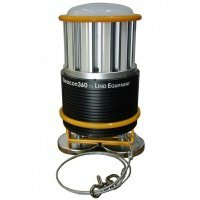 The LE360LEDC is a high-efficiency battery operated LED floodlight that provides unparalleled portability and illumination for wet locations, remote sites or otherwise inaccessible areas. High efficiency LEDs coupled with cutting-edge battery technology provide users with the versatility and control to customize light output based on their exact needs. Fire and rescue crews, contractors and mobile work crews can now light areas that don’t have power without compromising light output or light duration. The Beacon can be placed on a flat surface, hung or attached to a metal surface magnetically. Eliminate extension cords and generators. Reduced downtime on job sites. Extremely versatile light formultiple applications. Powerful battery technology provides 4-25 hours of run time. Battery and charger included. LEDs will last over 50,000 hours. Instant start-up, at full output, even in cold temperatures.